Of Marriageable Age is a cleverly crafted and intricately woven story dealing with the complexities of arranged marriages. 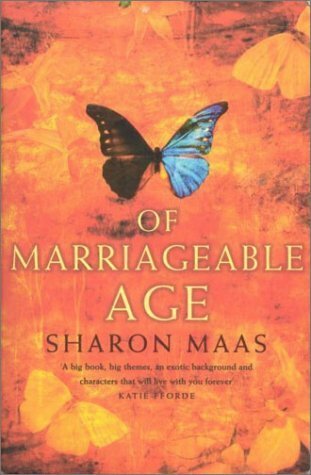 Sharon Maas has captured a certain innocence in her writing. This story grew inside her and was finally born in an ancient farmhouse where she typed in the depth of winter. Sharon pours the warmth of her very soul into the pages. This story will bathe you in balmy thoughts and entice you into its pages the way the ocean entices you to swim in its depths. She remembers what it feels like to be a child in the comforting safety of a mother’s love or how it feels to embrace a moment in time, so thoughtfully, it always clings to your memory. Her intense power of observation enables her to set up situations, which bring out the characters deepest fears, sublime longings and internal tortures. She creates tension at the end of each chapter, propelling you forward to read the next exciting detail. Each chapter in the first section focuses on one of the three main characters. This rotation of chapters invites you to follow the lives of Nat, Saroj and Savitri who in the first section are like streams of water moving towards a river. The second and third sections are more like a waterfall in which moments of enlightenment flow through you suddenly, as you realize how these three characters' lives intertwine. Each life is richly textured with cultural details as they move from the innocence of childhood into an adult awareness. The character development is outstanding. As the story grows and changes, hope grows within you that the characters will find the happiness they deserve. The Blue Morpho butterfly on the cover seems to represent Saroj, who must struggle through countless battles of thought to finally shed the insulation of her old life so she can embrace her destiny. She at first spins protective silk thoughts around herself, trapping herself so she can grow her wings. She is living in British Guiana, South America, in the 60s. I love her free spirit when she emerges from her cocoon, her imagination, her beloved places. Saroj tries to control her life and hurriedly rushes down paths as they are presented to her. She fights and wriggles free from her controlling father (an orthodox Hindu lawyer) only to see his true intentions years later. She finds a childhood friend named Trixie who seems to understand her rebellion. Trixie rescues her from the tapestry of a deeply rooted tradition. The men in this story seem more willing to follow tradition, to accept their fate. Nat is adopted by a doctor working in rural India (Madras State, 1947) and not only has the ability to heal, he later has the ability to water thirsty souls and women are drawn to him. He longs to find a woman who will invite him into her secret life. He realizes women are seeking spiritual unity and that true strength is gentle. Women long for a connection of the soul. He also wants to uncover the mystery of his own life. Savitri understands silence. She lives from the inside and knows that the man she loves is the other part of her soul. Forbidden fruit is irresistible to her, yet she also has the ability to love unconditionally. She is a servant (cook’s daughter) of the Lindsays, an English family living in India. She falls in love with the master’s son. Her story starts in Madras, India, in 1921. She and David observe one another from a distance, living separate lives, wanting to find some connection that threatens to dissolve them both into a sea of troubles. While the storms of their lives threaten to tear them apart forever, somehow they manage to find a few moments of absolute bliss. While Nat and Savitri’s stories are essential to the plot, Saroj is definitely the main character who evolves through a process of choices and situations thrust upon her by life. Her exuberance for life is woven into thoughtful prose. You enter her world, one which she is trying to abandon. Her very soul desperately cries out not to be tied down to duty. She wants to make her own choices, especially when it comes to choosing a husband, her lover for life. Standing at the window of her mind, you will observe the most intimate of thoughts. She will capture your heart. Instead of embracing various moment at times, she dreads her fate, the impending doom. She is dramatic and horrified at the thought of being forced into marriage at a marriageable age. She knows that in life, there is one man who is worthy of her intelligence and beauty. Locked in the prison of her father’s discontent, the depths of her passion give her mind buoyancy. She at times flies away on her thoughts. An impressive masterpiece of delicious thoughts. The prose will drip like mango juice into your thirsty soul. It will touch your life in a way no other story ever has. the labyrinths and gardens of your mind. to the endlessness of the sky, to the endlessness of time." 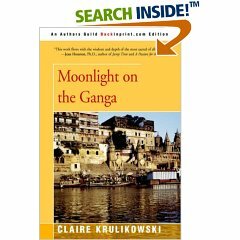 Moonlight on the Ganga draws out deep desires for the beauty you may never find in an art museum. This beauty is revealed in the experience of a simple glance, the awakening of recognition or the exquisite taste of comforting moments in which the soul truly rests in peace. Claire Krulikowski finds this solitude in the "thunderous song of the river." Through vignettes describing her encounters, her humor often catches you unawares. Her vivid writing captures your imagination as she leads you gently to conclusions of the heart. Every nuance of her experience is felt in its warmth and dramatic lucidity. The story of her journey births within you a sense of heightened curiosity as she masterfully paints images of orange marigolds, shopkeepers, pilgrims and swamis. She also explains how monkeys find their way into her room, takes the reader on journeys to exotic locals, addresses unique confrontations, explores peaceful vistas and meets people living in constant contact with a magnificent river. This journey seems to be an essential part of Claire's own spiritual path. She must face overwhelming fears, address aspects of primal survival and encounter her teachers in various guises to grow and mature into a beautiful awareness of life itself in all its suffering and elation. Her spiritual insight shows a striking clarity of vision. A sense of freedom in the moment permeates every page. As she is tested in disarming ways, life is smiling. How do you address hunger, death, accidents and conflicting emotions while only longing for peace, solitude and a good cup of Chai tea? This enchanting mosaic is profoundly spiritual while retaining an especially realistic portrait of life. Intimate conversations with strangers are more important than shopping and feelings of helplessness turn to compassion through the observation of suffering. With striking powers of observation, Claire's writing leads you through an enchanting landscape where a revered river nurtures, heals and accepts prayers that float as flowers on the ripples until descending into the silent depths. When you finish reading this book you will long for Claire's experiences and then realize they are offered to you, wherever you live.